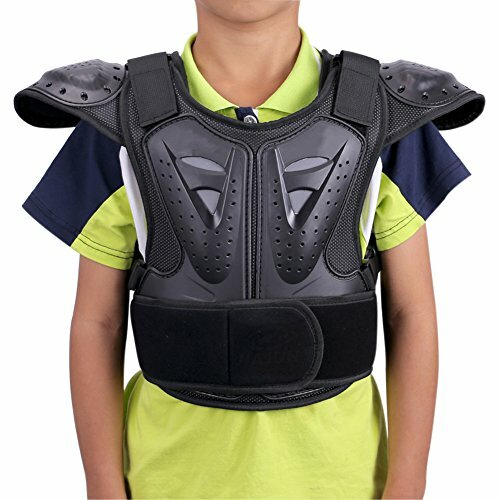 Kids Chest Spine Protector Body Armor Vest Protective Gear for Dirt Bike Motocross Snowboarding Skiing are both suit for boys and girls. Adjustable straps throughout the arms and shoulders. Wide elastic waist belt with magic strips adjustment. The Ease Of Wearing: The front and rear can be disassembled. Adjustable: Freely adjust waist by a wide velcro waist strap and a small button waist strap. A Wide Range Of Usage: Effectively protect children's chest, spine, shoulder,waist for dirt bike, mountain bike, motorcycle riding, cycling, skateboarding, skiing, etc. View More In Chest & Back Protectors.